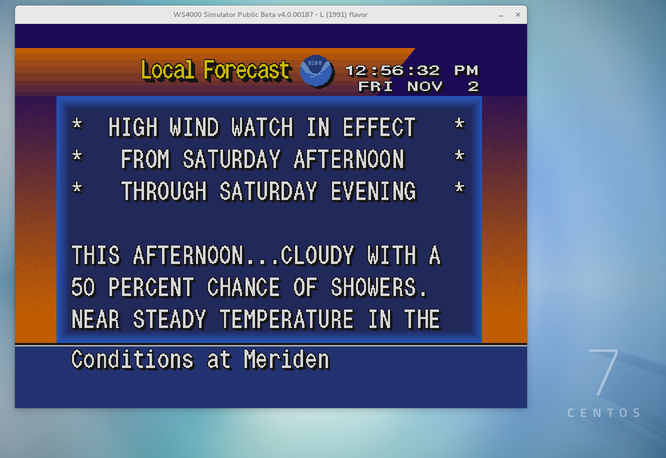 Modern weather software. Classic 4000 look. 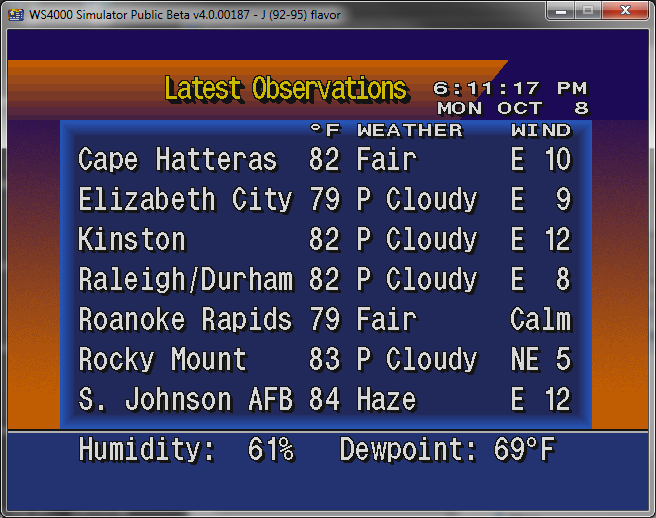 A summary of the latest weather observations from your local observing station. 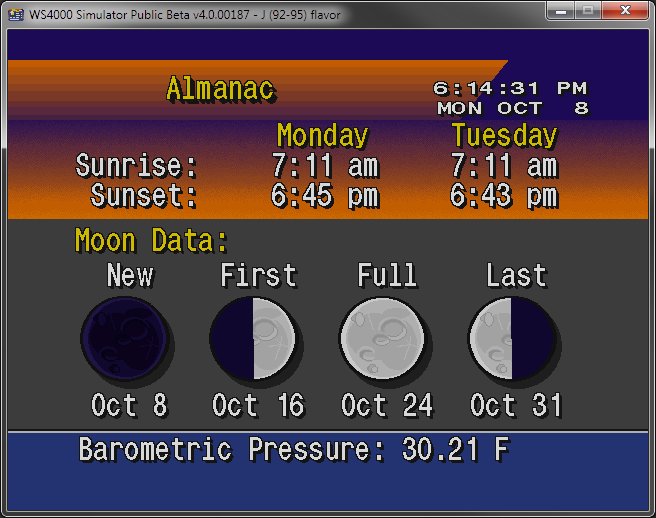 Upcoming sunrise, sunset, and moon phase times for your chosen hometown. Current weather conditions and temperatures across your chosen region. 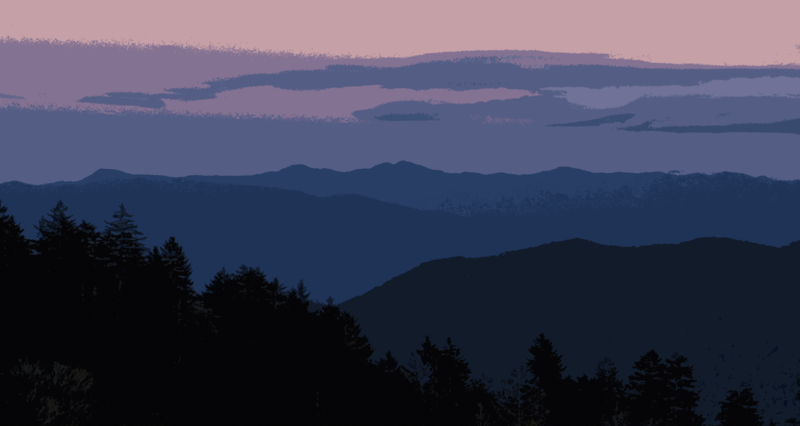 A brief text-based summary of weather conditions at seven observing stations in your area. 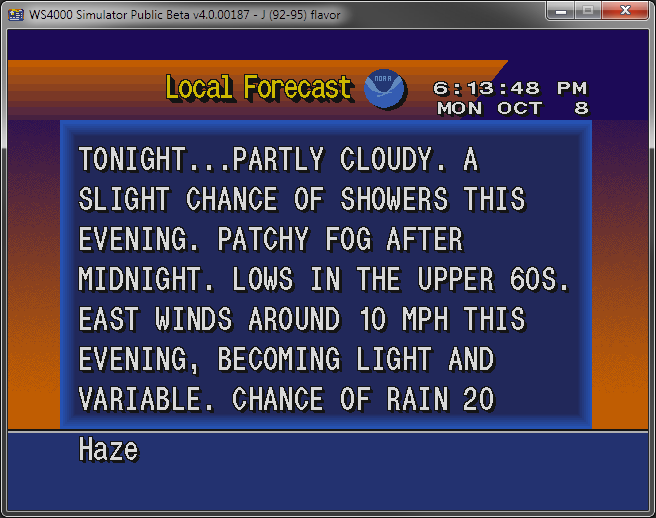 Text-based National Weather Service forecast of the weather conditions in your hometown over the next day and a half. 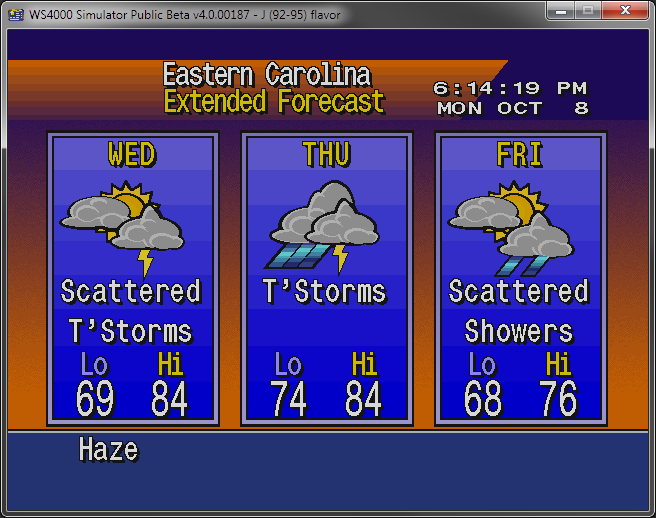 A three day graphical forecast for your hometown generated from digital National Weather Service forecast grids. 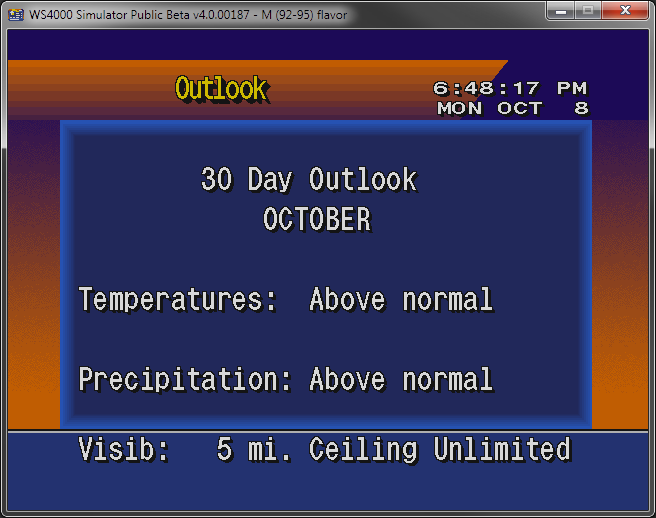 A text-based, long range forecast for your region for the next 30 days derived from digital data from the Climate Prediction Center. 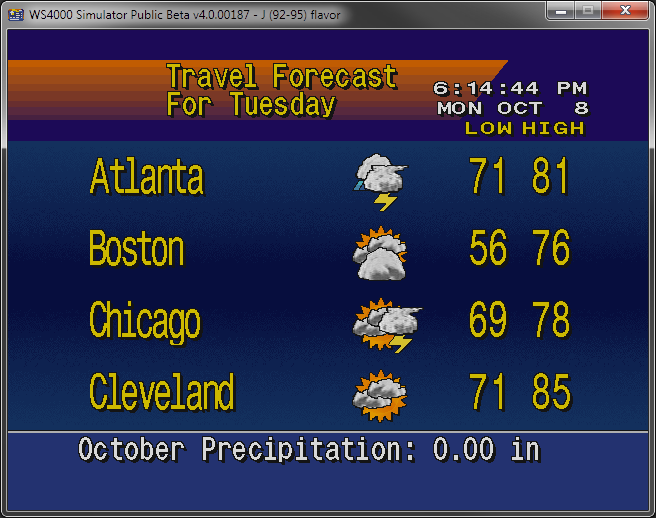 A graphical map-based forecast for your region generated from digital National Weather Service forecast grids. A graphical forecast with high and low temperatures for 24 cities across the nation generated from digital National Weather Service forecast grids. 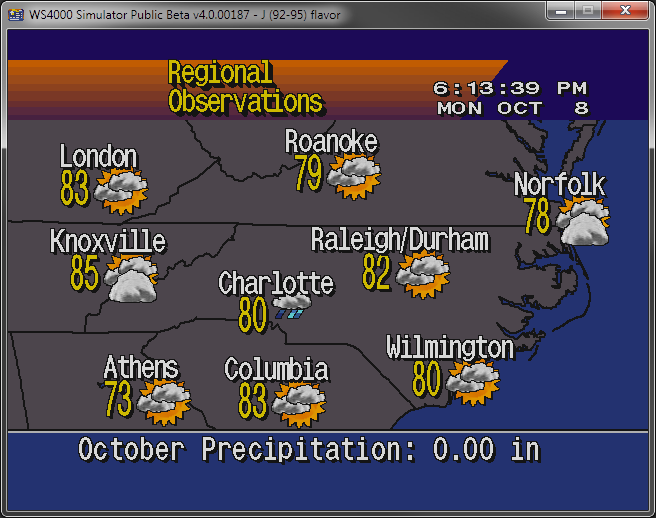 Shows precipitation in your local area, in both static (Current Radar) and animated (Local Radar) form. 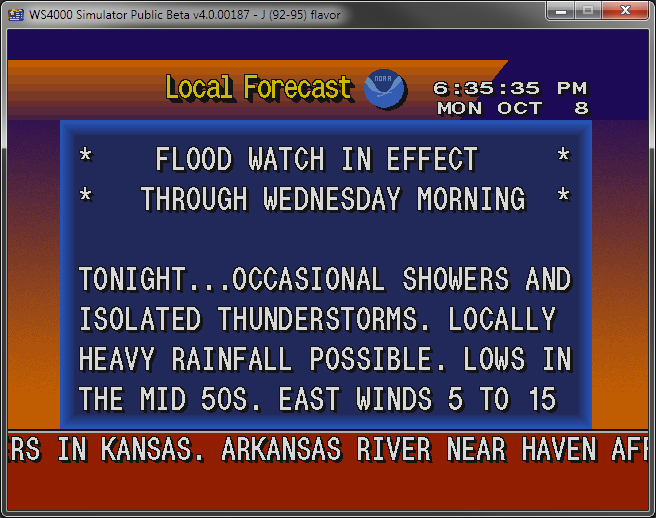 For important National Weather Service issued statements, watches, and advisories. For critical National Weather Service warnings which highlight an imminent threat to life and property. Create your own lineups (flavors) or choose from dozens of built-in ones. 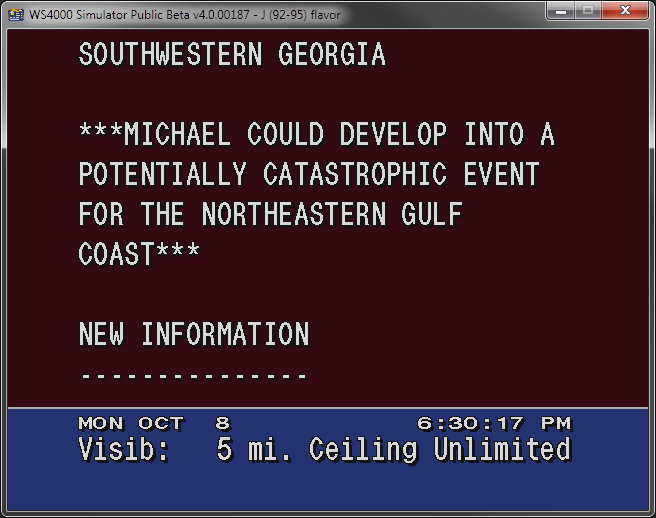 Control ordering, time on screen, narration type. Fine-tune LDL behavior. 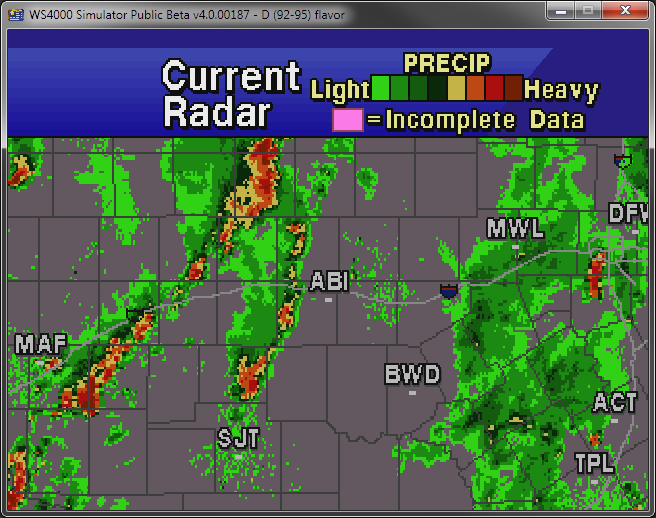 You can even define exactly how fast the local radar frames animate. The simulator incorporates the FMOD sound engine, a proven audio solution with a long history of being utilized in several AAA game titles. 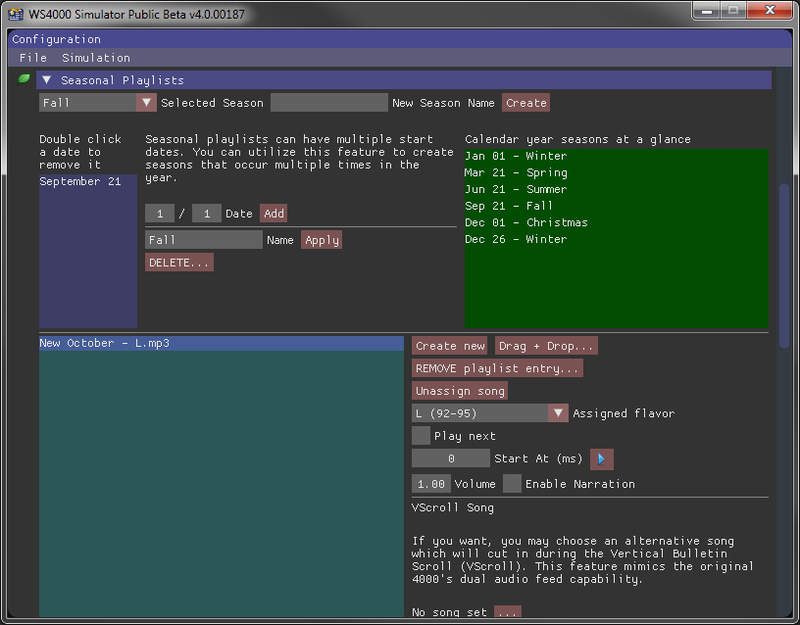 With the FMOD sound engine, a variety of non-DRM protected codecs are supported for your music files. Detailed customizations are possible, including millisecond precision on when a song starts, associating a song with a flavor, and even having a different song file play during Vertical Bulletin Scroll advisories. You can even add your own messages to be scrolled on the LDL, just like the 4000 did. Ten different crawl messages can be stored along with the ability to schedule them from 15 minute display intervals up to 24 hours. 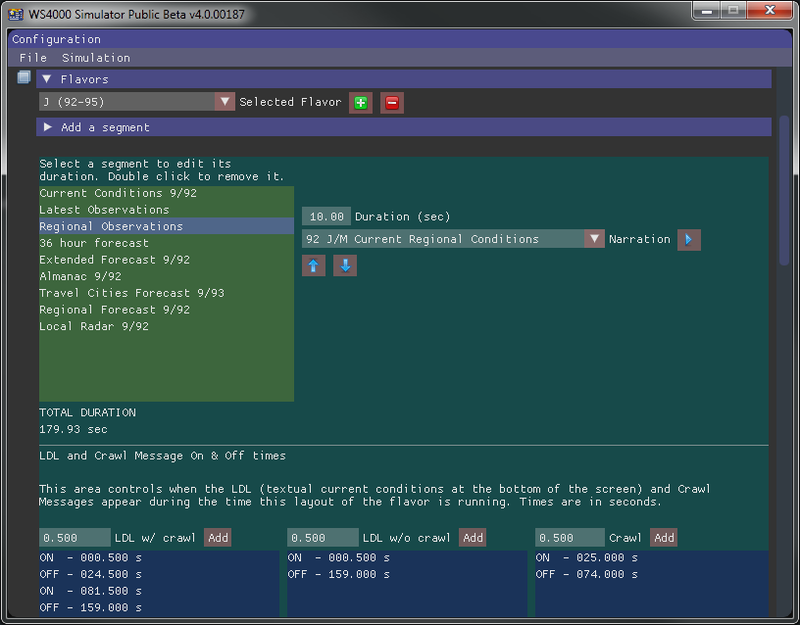 The configuration and time scheduling functionality for crawl messages was modeled precisely after the 4000's. The simulator is a 64-bit application built with modern C++ and a custom rendering engine to efficiently utilize the capabilities of today's GPUs. This engine was developed with the graphical requirements of the simulator in mind from the start, ensuring that much of the exact visual behavior of the 4000 could be faithfully recreated. The binary is designed to be as minimalist and portable as possible, with a total of three files required to run (simulator binary itself, its resource file, and the FMOD sound library). The simulator does not write to your system registry (Windows) or other global configuration stores, rather it saves its settings in a locale file and profile file. There's no worries about registry bloat or running cumbersome installation/uninstallation programs, nor nightmarish arcane registry search expeditions to locate where your configuration settings reside. The forecasts displayed are generated entirely from the National Weather Service's digital forecast grids, which allows for a high degree of resolution based on longitude and latitude, as well as the ability to recreate how the 4000 handled different forecast conditions. 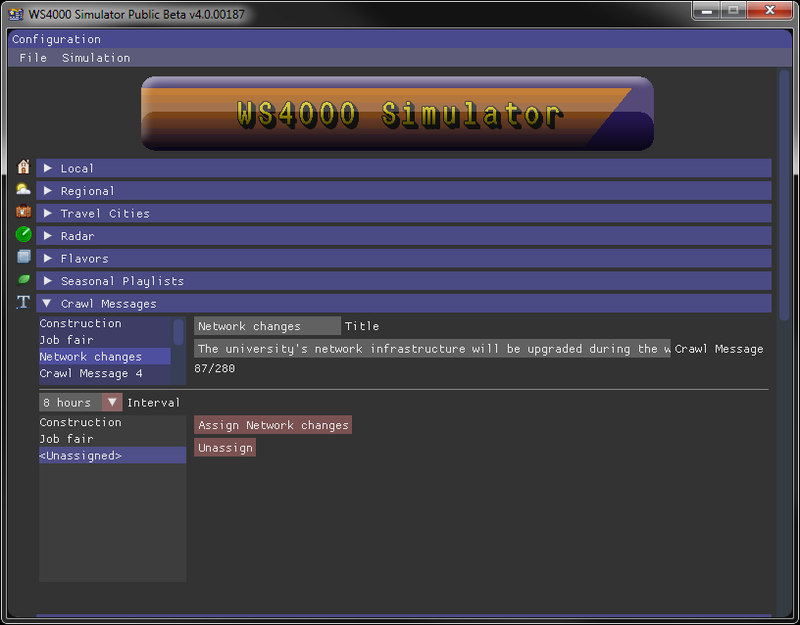 The simulator was written to be cross-platform and run natively on Windows, macOS, and Linux distros. Want to run it on your Ubuntu or Arch Linux distro? Just get the linux binary. Have a macbook? Get the MacOS dmg. Best of all, configuration and locale files you create with the simulator are fully binary compatible across operating systems, so if you start creating a locale on your mac and want to keep working on it with your windows machine later, all you have to do is copy the w4k file and resume where you left off. 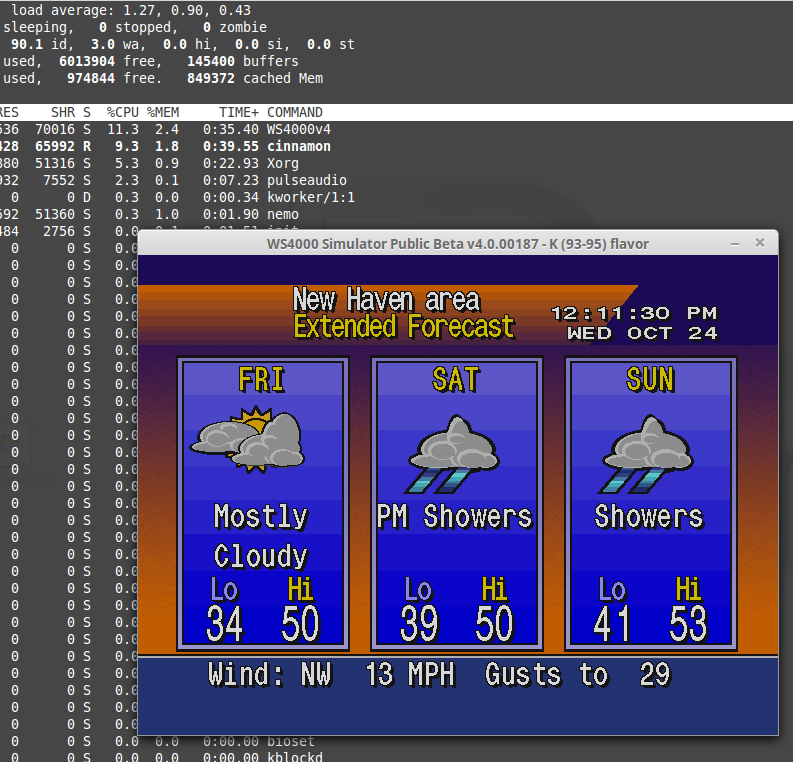 The simulator running in CentOS 7. 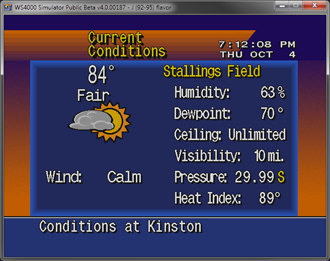 The simulator running in Linux Mint 17. 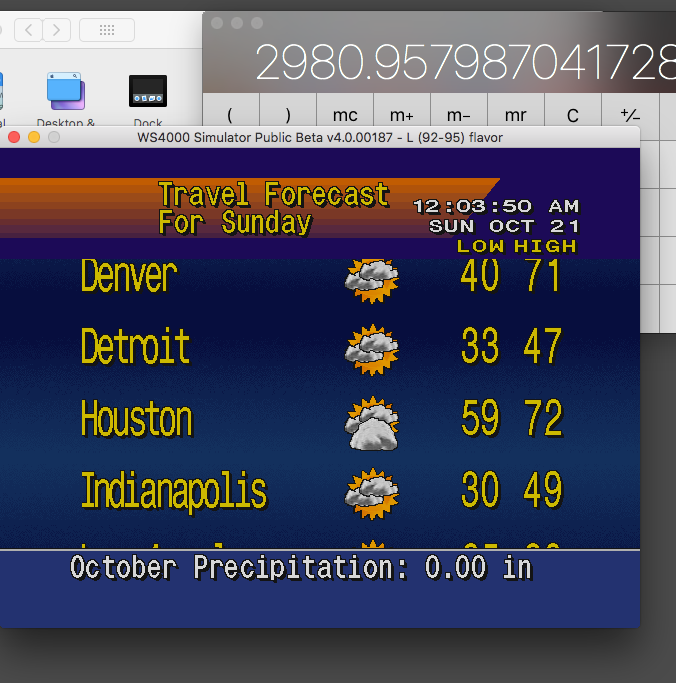 The simulator running in mac OSX High Sierra.